This volume brings together the current theoretical interest in reconceptualizing second and foreign language learning from a sociocultural perspective on language and learning, with practical concerns about second and foreign language pedagogy. It presents a set of studies whose focus is on the empirical description of particular practices constructed in classroom interaction that promote the learning of a second or foreign language. The authors examine in detail the processes by which the learning of additional languages is accomplished in the interaction of a variety of classrooms and in a variety of languages. 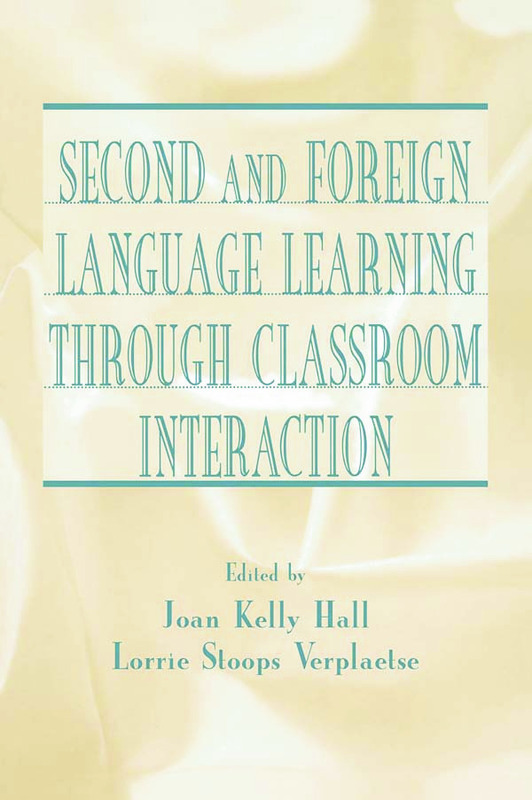 Not only will the findings from the studies reported in this volume help to lay a foundation for the development of a more expansive, sociocultural model of second and foreign language learning, but on a more practical level they will help language educators in creating a set of principles for identifying and sustaining classroom interactional practices that foster additional language development. * Following a Vygotskyan perspective on development, the studies assume that language learning is a fundamentally pragmatic enterprise, intrinsically linked to language use. This breaks from a more traditional understanding of second and foreign language learning, which has viewed learning and use as two distinct phenomena. The importance of classroom interaction to additional language development is foregrounded. * The investigations reported in this book are distinguished by their methodological approach. Because language learning is assumed to be a situated, context-sensitive, and dynamic process, the studies do not rely on traditional experimental methods for collecting and analyzing data, but rather, they involve primarily the use of ethnographic and discourse analytic methods. * The studies focus on interactional practices that promote second and foreign language learning. Although a great deal of research has examined first language learning in classrooms from a sociocultural perspective, little has looked at second and foreign language classrooms from such a perspective. Thus there is a strong need for this volume of studies addressing this area of research. Researchers, teacher educators, and graduate students across the fields of second and foreign language learning, applied linguistics, and language education will find this book informative and relevant. Because of the programmatic implications arising from the studies, it will also appeal to teacher educators and teachers of second and foreign languages from the elementary to the university levels. "The compilation of studies makes interesting and thought-provoking reading….Second and Foreign Language Learning Through Classroom Interaction makes a significant contribution…"
"Each essay in the book sheds some light on classroom practices that help facilitate language learning….This is a meticulously edited, scholarly book. True to traditional academic writing practice, the introduction and essays are followed by extensive, up-to-date bibliographies….It challenges teachers to rethink their methods." "Reflects the current trend in the field of foreign- and second-language acquisition studies to view language learning as a group phenomenon rather than the traditional perspective of language learning as an individual process. This book rightly places language learning within the context of socialization and interaction. And, also rightly, it separates the distinct issues involved with the learning of a foreign language from those involved with learning a second language. I also appreciate the narrative, qualitative nature of the individual chapters, which reflect sensitive and thoughtful research practices." "Well grounded in current theory and research which has turned its attention to interlanguage development through interaction and language use….Fills a gap in existing research publications." Contents: Preface. J.K. Hall, L.S. Verplaetse, The Development of Second and Foreign Language Learning Through Classroom Interaction. Part I: Classroom Interaction and Foreign Language Learning. C. Kinginger, Learning the Pragmatics of Solidarity in the Networked Foreign Language Classroom. A.S. Ohta, Rethinking Recasts: A Learner-Centered Examination of Corrective Feedback in the Japanese Language Classroom. P.N. Sullivan, Spoken Artistry: Performance in a Foreign Language Classroom. D.A. Consolo, Teachers' Action and Student Oral Participation in Classroom Interaction. P.A. Duff, Repetition in Foreign Language Classroom Interaction. E. Takahashi, T. Austin, Y. Morimoto, Social Interaction and Language Development in a FLES Classroom. Part II: Classroom Interaction and Second Language Learning. M. Boyd, V.M. Maloof, How Teachers Can Build On Student-Proposed Intertextual Links to Facilitate Student Talk in the ESL Classroom. D.E. McCormick, R. Donato, Teacher Questions as Scaffolded Assistance in an ESL Classroom. D. Boxer, F. Cortés-Conde, Identity and Ideology: Culture and Pragmatics in Content-Based ESL. L.S. Verplaetse, Mr. Wonder-ful: Portrait of a Dialogic Teacher. R. Damhuis, A Different Teacher Role in Language Arts Education: Interaction in a Small Circle With Teacher. M. Hajer, Creating a Language-Promoting Classroom: Content-Area Teachers at Work. J.K. Hall, Classroom Interaction and Additional Language Learning: Implications for Teaching and Research.